The diagnostic test harness is a must have. They power up the vehicle electronic control unit independent of the vehicle chassis wiring. Just connect the two power leads to the battery and turn on the switch. Using the vehicle’s starter, you can start and run the engine. There is also a diagnostic plug output and plug for throttle position sensor input. 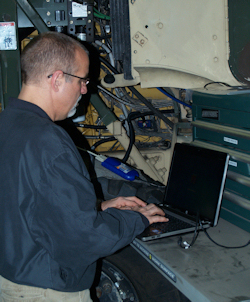 Bench testing and programming of the vehicle electronic control unit. Temporary power to the vehicle ECU, so that you can run power take off mounted equipment. Troubleshooting chassis wiring problems--if the engine runs with this harness, then the problem is in the vehicle’s chassis wiring. For more information about any of these diagnostic computers or to place an order you can contact us by email at sales@truckdiagnostics.com or by phone at 920-732-1500. The mission of Truck Diagnostics Inc. is to provide cost effective, easy to use, heavy duty vehicle diagnostic equipment and services.